Question: Why do the female peregrines start laying their eggs at such different times? Is this difference site specific or female specific? Answer: Egg-laying times are site specific in a macro sense (large-scale geography) and female specific in a micro sense (regional geography and individual biology). Peregrines who nest in the middle latitudes lay their eggs from mid-March to late-April at a time when arctic peregrines haven’t even left South America for the Arctic yet. Within the same latitude, it’s female specific. The Gulf Tower female Tasha (1998 to 2010) always laid her eggs early, between March 10 and 17. So did her daughter (“SW”) who nested in Cleveland, so I think early egg-laying could be an inherited trait. Other female peregrines at this latitude lay a week or two later than that. In Pittsburgh, the females at the Cathedral of Learning and Gulf Tower typically lay their first eggs between March 12 and March 20. 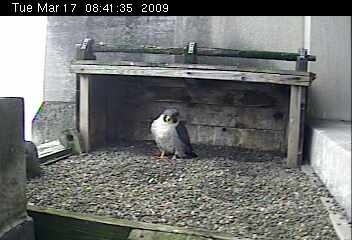 You will know that egg laying is approaching when the female peregrine spends all night standing in the scrape.